Multilayered with nature-inspired details, this project uses ombres and printed fabrics to give delicate roses and flowers a three-dimensional effect. Baltimore Album stitchers used many different fabrics, each piece carefully selected and purposefully chosen for a desired effect. Rita teaches needle-turn appliqué and focuses on stitching techniques for both novices and advanced quilters. 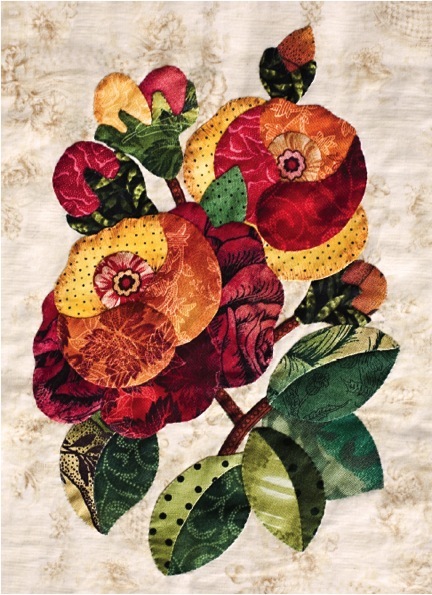 Students will have the opportunity to learn all the basic appliqué skills: basic stitch, perfect points, inverted Vs and valleys, skinny stems, and split leaves. Furthermore, Rita discusses the tricks and techniques of choosing solid and printed fabric that will enhance the design, shading, and dimension of a pattern. If the class is being held at a quilt store, a fun way to start the class is to help with the selection of a chosen color palette. Set up common cutting and pressing station and a light table.